Recent research by the EPA has concluded that one in six women of childbearing age have unsafe levels of mercury in their bodies, which puts 630,000 newborn babies each year at risk of neurological impairment. Mercury poses severe risks to the health of animals and ecosystems around the world, and this book provides the essential information that anyone interested in environmental sciences should know about the fundamentals of the entire mercury cycle. 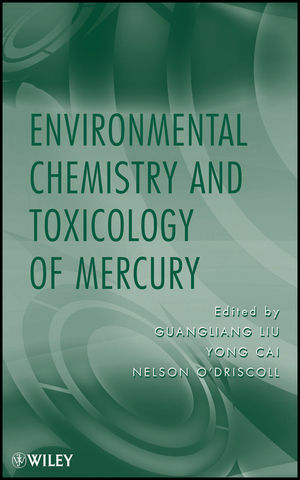 Comprised of four parts that present an overview of mercury in the environment, mercury transformations, transport, and bioaccumulation and toxicology, each chapter of Environmental Chemistry and Toxicology of Mercury includes the basic concepts of the targeted subject, a critical review of that subject, and the future research needs. This book explains the environmental behavior and toxicological effects of mercury on humans and other organisms, and provides a baseline for what is known and what uncertainties remain in respect to mercury cycling. The chapters focus on the fundamental science underlying the environmental chemistry and fate of mercury. This work will be invaluable to a wide range of policy experts, environmental scientists, and other people requiring a comprehensive source for the state of the science in this field. Guangliang Liu, PhD, is Research Scientist in the Department of Chemistry and Biochemistry, Florida International University, where he manages the Mercury Laboratory. Yong Cai, PhD, is Professor in the Department of Chemistry and Biochemistry, Florida International University. He has been working on environmental chemistry and the geochemistry of mercury for almost twenty years. Nelson O'Driscoll, PhD, is Canada Research Chair in Environmental Biogeochemistry and Associate Professor in the Department of Earth and Environmental Science, Acadia University.